Adrie JC Steyn, Assistant Professor, Department of Microbiology, received his B.Sc. and M.Sc. degrees in Microbiology from the University of Stellenbosch, South Africa. 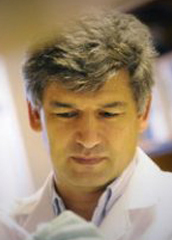 He completed his thesis in the lab of Professor Julius Marmur at the Department of Biochemistry at the Albert Einstein College of Medicine, New York and was awarded a Ph.D. degree from the University of Stellenbosch in 1995. Dr. Steyn subsequently conducted postdoctoral research as a Howard Hughes Fellow in the lab of Dr. Barry Bloom at the Albert Einstein College of Medicine. In 1999 he moved with Dr. Bloom to the Harvard School of Public Health where he became a research associate and eventually research scientist. He joined the Department of Microbiology at UAB as an Assistant Professor in July 2003. M. tuberculosis, the etiological agent of TB is one of the most effective human pathogens and is responsible for 2.2 million deaths every year (1 death every 10 seconds). It is estimated that a total of 225 million new cases and 79 million deaths will occur between 1998 and 2030. Tuberculosis (TB) continues to pose a significant threat to mankind that cannot be conquered without an effective vaccine strategy, which remains unavailable to date. The prophylactic vaccine BCG (Bacille Calmette-Guerin), fails to protect against the most common form of disease, adult pulmonary tuberculosis, and its efficacy varies dramatically e.g., from 0% in South India to 80% in the UK. Since the lungs of an infected patient contain more than a billion bacilli, poor treatment compliance can easily lead to multi drug resistant (MDR) strains. The cost for treating a patient infected with MDR-TB (currently designated as Category C Priority pathogens) can approach $250,000 about 10-15 times the cost for treating a drug-sensitive case. One of the greatest risk factors for TB is HIV, which increases the risk of developing tuberculosis 30-fold. Our long-term goal is to understand the mechanisms of M. tuberculosis virulence. The first project involves a gene, whiB3, which appears to play a unique role in the bacterium-host interaction. We established that WhiB3 interacts with the 4.2 domain of the principal sigma factor, RpoV in virulent M. tuberculosis, but not with RpoV of an attenuated strain containing a single point mutation (Arg515-His) in the 4.2 domain. Our studies showed that the M. tuberculosis whiB3 mutant behaved identical to the wild-type strain with respect to its ability to replicate in mice, but was attenuated in terms of host survival. In addition, the whiB3 mutant strain showed much reduced lung pathology, compared to wild type infected mice. Intriguingly, we showed that a whiB3 mutant of virulent Mycobacterium bovis was completely impaired for growth in guinea pigs. These mutants define a new class of virulence genes in M. tuberculosis and M. bovis. M. tuberculosis contains seven WhiB homologues that show strong similarity to Streptomyces spp. proteins that are required for sporulation. We hypothesize that WhiB3 controls a subset of genes required for virulence. It is notable that this virulence gene would not have been detected using conventional screens such as signature mutagenesis, which screen primarily for mutants defective in growth and not virulence. A second project in the laboratory involves the development and application of "in vivo expression technology (IVET)" to rapidly identify M. tuberculosis genes that are specifically induced during infection in vivo. Since many bacterial virulence determinants share a unique phenotype - induction in the host; the development of such a system for mycobacteria would be of significance. Subsequently, we have successfully developed a genetic system, which uses the animal as a selective medium to identify M. tuberculosis genes specifically induced during infection. These in vivo induced genes are poorly expressed on laboratory medium, but exhibit elevated levels of expression in host tissues and suggest that they contribute to growth in restricted host tissues and thus enhance pathogenicity. A third project in the laboratory is studying signal transduction pathways in M. tuberculosis. In most bacterial two-component systems, the signals or components of the two-component signaling pathways are mostly uncharacterized. We hypothesized that accessory proteins communicate directly, through direct protein-protein communication with the M. tuberculosis two component histidine kinases to modulate gene expression. Subsequently, we have shown that the sensing module of the M. tuberculosis histidine kinase KdpD specifically interacts with two membrane proteins, and that the N-terminal sensing module of KdpD and the histidine kinase domain of KdpD form a ternary complex with these membrane proteins. Our results suggest that the membrane proteins function as accessory or ligand-binding proteins that communicate directly with the sensing domain of KdpD to modulate kdp expression. Kumar A, Deshane JS, Crossman DK, Bolisetty S, Yan BS, Kramnik I, Agarwal A, Steyn AJ. Heme oxygenase-1 derived carbon monoxide induces the Mycobacterium tuberculosis dormancy regulon. Hett EC, Chao MC, Steyn AJ, Fortune SM, Deng LL, Rubin EJ. A partner for the resuscitation-promoting factors of Mycobacterium tuberculosis. Mol Microbiol. 2007 Nov;66(3):658-68. Singh A, Guidry L, Narasimhulu KV, Mai D, Trombley J, Redding KE, Giles GI, Lancaster JR Jr, Steyn AJC. Mycobacterium tuberculosis WhiB3 responds to O2 and nitric oxide via its [4Fe-4S] cluster and is essential for nutrient starvation survival. Proc Natl Acad Sci U S A. 2007 Jul 10;104(28):11562-7. Kumar A, Toledo JC, Patel RP, Lancaster JR Jr, Steyn AJC. Mycobacterium tuberculosis DosS is a redox sensor and DosT is a hypoxia sensor. Proc Natl Acad Sci U S A. 2007 Jul 10; 104(28): 11568-73. Singh A, Mai D, Kumar A, and Steyn AJC. Dissecting virulence pathways of Mycobacterium tuberculosis through protein-protein association. Proc Natl Acad Sci U S A. 2006 Jul 25;103(30):11346-51. JM Eksteen, Steyn AJC, van Rensburg P, Cordero Otero RR and Pretorius, IS. Cloning and characterization of a second alpha-amylase gene (LKA2) from Lipomyces kononenkoae IGC4052B and its expression in Saccharomyces cerevisiae. Yeast 2003. 20:69-78. Steyn AJC, Collins D., Hondalus M., Jacobs WR, Kawakami RP, Bloom BR. M. tuberculosis WhiB3 interacts with RpoV to affect host survival, but is dispensable for in vivo growth. Proc Natl Acad Sci U S A. 2002. 99(5):3147-3152. Alland D, Steyn AJC, Weisbrod T, Aldrich K, and Jacobs WR. Characterization of the Mycobacterium tuberculosis iniBAC promoter, a promoter that responds to cell wall biosynthesis inhibition. Journal of Bacteriology 2000. 182:1802-1811. Steyn AJC, Chan J, and Mehra V. Recent developments in mycobacterial research. Current Opinion in Infectious Disease 1999. 12:415-424. Steyn AJC, Pretorius IS, and Marmur J. Cloning, mapping and functional expression of a genomic copy of the Lipomyces kononenkoae alpha-amylase-encoding gene (LKAI) in Saccharomyces cerevisiae. Yeast 1996. 12:925-937. Swart AC, Swart P, Roux SP, van der Merwe KJ, Pretorius IS, and Steyn AJC. Expression of human P450c17 as an export protein in Saccharomyces cerevisiae. Endocrine Research 1995. 21(1-2):289-295. Steyn AJC, Pretorius IS, and Marmur J. Cloning, sequence analysis and expression in yeasts of a cDNA containing a Lipomyces kononenkoae alpha-amylase-encoding-gene. Gene 1995. 166:65-71. Steyn AJC, and Pretorius IS. Characterization of a novel alpha-amylase from Lipomyces kononenkoae and expression of its gene (LKAI) in Saccharomyces cerevisiae. Current Genetics 1995. 28:526-533. Janse BJH, Steyn AJC, and Pretorius IS. Regional sequence homologies in starch degrading enzymes. Current Genetics 1993. 24:400-407. Southgate VJ, Steyn AJC, Pretorius IS, and Van Vuuren HJJ. Expression and secretion of Bacillus amyloliquefaciens alpha-amylase by using the yeast pheromone-factor promoter and leader sequence in Saccharomyces cerevisiae. Applied and Environmental Microbiology 1993. 59(4):1253-1258. Steyn AJC, and Pretorius IS. Stable co-expression of cloned yeast glucoamylase and Bacillus alpha-amylase genes in transformed Saccharomyces cerevisiae. Gene 1991. 100:85-93.